It can be stressful when you have a problem with your roof after hours, your pulse is pounding and you are not sure who you can turn to. With Pioneer Roofers on your side, you don’t have to handle your late night emergency roof situation on your own. We get to you quickly in order to perform fast, reliable, and accurate emergency roofer work. We’re also on call, so no matter when your emergency occurs, there will be someone to answer your call for help, and take action. Simply put, when you need a quality emergency roofer Portland contact Pioneer Roofers. With Pioneer Roofers you won’t have to make a second call. The dangers of waiting when it comes your roofing needs can become apparent very quickly. There are certain types of damage, that when paired with the extreme weather conditions often faced by citizens in Portland, can cause escalating damage to your home or place of business. If left untreated, problems that could be solved by an emergency roofer in Portland quickly progress. This damage can cause electrical, foundation, and structural problems that only increase the longer you wait. One of the biggest problems caused by untreated roof damage is due to water. You drink it everyday, you swim in it, you catch fish in it; it seems innocent enough, but water causes progressive property damage, and Portland gets 2/3 of its total yearly rainfall between October and March. 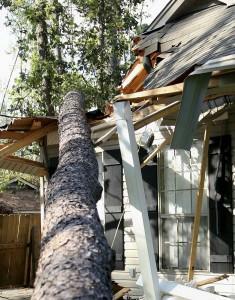 Wind storms also occur during the winter season that send trees, branches, and other debris hurtling into your roof. Ceiling and Attic Damage – Damage can occur to an attic and the items in it. When you house doesn’t have an attic, damage to the ceiling will affect the paint and plaster. This may also leak onto nearby walls and can damage any fans or lights that are mounted in the ceiling. Midlew and Mold – This is a problem that is likely to occur in the long-term, but roofs that don’t receive repair from an emergency roofer Portland can easily leak water into walls, vents, and hvac systems. This mold or mildew can quickly spread, and toxic black mold growth is likely to occur if the leak is not treated as quickly as possible. Fire Damage – Though it sounds strange, water can cause damage to electrical components and actually start a fire. Insulation Damage – Leaky roofs can saturate and destroy the insulating properties of your fiberglass and cellulose insulation. This loss can make it quite costly to both heat and cool your home. Structural Damage – The most severe and detrimental damage to your home is structural. It doesn’t take long for water to damage wall framing, trim, ceiling joists, and rafters. This deterioration and rot of the wood can lead to costly repairs down the line and serious injury if part or all of the structure collapses. We operate from dawn till…dawn. When you need a 24 hr roofer in Portland you need to know that they’ll answer your call. We always will, providing excellent service, repairs, and ultimately saving you money in costly damages. When you need an emergency roofer Portland, call Pioneer Roofers (503) 281-0305 any time, day or night.